The Queen of Bavaria or Golden Conure is the most beautiful and most sought after of all the conures! A very rare and highly endangered species, the Queen of Bavaria Conure also known as the Golden Conure is protected against collection and importation, as well as being closely regulated in the United States. It is also very expensive. The Queen of Bavaria Conure does makes a spectacular pet that is very beautiful and affectionate. Being quite intelligent makes them easy to tame and train. They can be good talkers, but like many of the Aratinga conures they can also be very loud. The Queen of Bavaria Conures or Golden Conures are very lively little birds, though in captivity they will rarely fly. Rather they choose to climb about, perform acrobatic maneuvers, and be quite comical. Human companionship is greatly enjoyed and they can be very affectionate. A favorite activity is to chew, so be sure to provide lots of wooden toys to keep them from becoming bored. This conure does have one bad habit, they are prone to feather plucking, especially the wings and chest. This is possibly due to their high energy needs, and becoming bored in a limited space without enough activity or stimulation. It is recommended that you give them plenty of toys and freedom of movement, as well as plenty of proteins, calcium, and mineral supplements. Dr. Jungles says,...Wow! "Boots" and Bottoms" are celebrities! "My Queens, "Boots" and "Bottoms", became "famous" doing a Hagen ad!" "The Queens are called the Queens of Bavaria, sometimes the Golden Parrot. They really DNA wise do not completely belong to any family but are closest to the conure. They are nutty, playful, love fun, sliding down pillows on the sofa, hang from curtains, are very affectionate and I never found them to be at all aggressive, even when on eggs! The Queen of Bavaria Conure or Golden Conure is found in a remote area of northeastern Brazil. They have long been known to naturalists. A Dr. Greene is said to have described this bird as the Golden Parrot in a writing in 1887, and he advises that there was a specimen in the London Zoo since 1871. They were first bred in Sri Lanka in 1939, and in the United States in 1945. Due to the destruction of thousands of acres of jungle, their native habitat has been drastically reduced. Today they are extremely rare and are protected. Even in captivity there are limited numbers and their status is very fragile. Keeping them in captive breeding programs has taken precedence hopefully with the aim of precluding any further need to collect them from the wild. The Queen of Bavaria Conure or Golden Conure, a small member of the parrot family, is considered the most beautiful of the conures. They are a brilliant golden yellow with only the lower portion of the wings being green. They rather resemble a small macaw with a beak and head that is quite large, though they have a relatively short tail. The eye is brown surrounded by a naked white eye ring. The beak is a pale horn color and the legs are a light pink. The young have green feathers in the plumage and the yellow is duller. They are fully feathered by 18 months of age. The Queen of Bavaria Conure or Golden Conure will reach up to 14 inches (35.5 cm) and weigh 8.8 ozs (249 g). In the wild they were at one time seen in pairs or small groups of up to about 60 birds, though today fewer birds are seen. They love to play, especially climbing and chewing. They can also be rather noisy. They breed readily in captivity and are not overly fussy about their nest, though they get quite aggressive to their keeper while breeding. If they lose their mate they are unlikely to pair with another. The female lays 3 to 4 eggs which are incubated for about 25 days. The young fledge (leave the nest) after about 10 weeks though the parents continue to feed them for some time after that. The Queen of Bavaria Conure or Golden Conure is not readily available as a pet, and is quite expensive. They cannot be sold between state lines in the United States unless both the buyer and the seller obtain a permit from the U.S. Fish and Wildlife Service. I have a 4 yr old Queen of Bavaria Conure for sale. He is beautiful, super healthy, very social and is an all around good guy. He would make a great family bird because he likes everyone and doesn't choose favorites :) I am moving and cannot bring him with me, I would love to find a good home for him. I am in Florida. If you are interested, please contact me and I will send you the price and photos. Thank you! Looking for a DNA 'd male queen of Bavaria. Will pay cash or trade for four year old female!!! 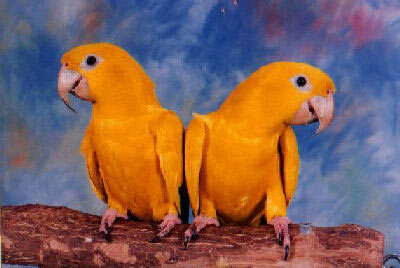 I would really to have your Golden Conure. I also live in Florida. What number can I call you? I live in Jacksonville. Where are you? Is your Queen of Bavaria conure still for sale? Thanks. I'm in palm beach county and looking for a male for my CBW program under the USFWS. almost thrity years doin this dedication work. I am in Garden Grove Calif. If you could respond with price and I info.I have parrots and am very well educated in their care. We just recently purchased a 4 month old female. We named her Mango. She is the most loving parrot I have ever seen. She loves fruits and veggies, peas seem to be her favorite. She spends 1-2hours cuddled in my neck/chin area. She kisses and loves the affection. We have had her 1 week and she already knows what the word OUT means. She is very smart she knows my voice and my husbands too, she enjoys spending time with our family and friends. I was afraid of birds until meeting and purchasing this beautiful Queen of Bavaria! If you are looking for a parrot that you can truly interact with and handle then this is the parrot for you! We are so thankful to have been able to find and purchase her. I'm looking for a mature male Golden for my female...I'm in Calif.
Want to buy any Queen of Bavaria conure aka Golden Conure. I have three golden conures that are now close to two months in the nest being raised for future breeding. IA M CBW PERMITTED, when wean and fledge at six months of age they will be ready go to a flight. sesing will be done to accomdate at buyers cost. three thousand dollars each. I have made my pair unavailable fo rmany babies so they can enjoy rasiing the three in teh nest box and I must charge to accomodate expences occrued. thank you payments can be made as they are being raised. I do have on you tube video's of th e three babie since hathcng..
Cherane, girl! You are everywhere! Haha! I love it! I kept for hugh till janaury a female being raised in the nest box whil all others sold. so, that one remaining female is now avialable. Looking for an older (4-5 yrs) female Queen of Bavaria conure in California.